Marble Slab Creamery franchise business opportunity. 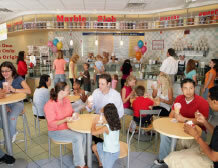 Free Marble Slab Creamery business franchise information. If you love ice cream like we love ice cream, join the Marble Slab Creamery family. Listed in Entrepreneur’s Franchise 500 as one of the fastest growing global franchises, we bring family fun to eating the freshest ice cream on earth! Founded in 1983, Marble Slab Creamery is the innovator of the frozen slab concept and is best known for its superpremium, homemade ice cream. Become a franchisee and we’ll teach you everything you need to know about running a successful store. Welcome to the world of freshness. Ingredients from around the world - Dairy from around the block. We travel a lot of miles to find the finest ingredients for our ice cream: to the tiny country of <?xml:namespace prefix = st1 ns = "urn:schemas-microsoft-com:office:smarttags" />Madagascar for vanilla beans, to Holland for cocoa, to Sweden for the world’s best dipping chocolate. Then we make our ice cream in the store with the freshest local dairy – never processed or preserved – one delicious batch at a time. The result is ice cream that’s smooth, creamy and flavorful – the best you’ll ever taste. Since 1983, we at Marble Slab Creamery have set our standards of quality unusually high. Not only is every batch of our superpremium ice cream homemade, we also hand-roll our freshly baked waffle cones in each store. As for mixins, we offer only the freshest fruits, the finest nuts, the sweetest candies, and the yummiest cookies around. So whatever your order, you can be sure it’s fresh and filled with fabulous flavor. The choices at Marble Slab Creamery are seemingly endless: dozens of rich, homemade ice cream flavors, hand-dipped waffle cones and a multitude of mixins. Then there are all of our other offerings: shakes, malts, sodas, floats, and fruit smoothies; sundaes, banana splits and other tantalizing treats; made-from-scratch cookies and brownies; and ice cream pies and cakes to turn any gathering into a special occasion. Marble Slab Creamery stores vary in size and shape, but all share very similar characteristics. All of our stores feature a clean, brightly lit, tri-color design, with comfortable seating and upbeat music. It is our goal to create a fun, family atmosphere in which our customers can enjoy their favorite ice cream desserts. Previous experience is always helpful to become a Marble Slab Creamery franchisee, but is not necessary. We have a complete 10-day training program at our company-owned store and home office in Houston, Texas. To learn more about the Marble Slab Creamery ice cream franchise opportunity, simply complete the form below.